My interest in Blender has spiked recently. I have always liked it, but somewhat feared it. But then, if you recall my Blender book review, the dam of trepidation was burst, and even more since I managed to get my Google SketchUp models converted into a suitable format for use inside Blender. Now, it's time to have some proper fun. After Kerkythea and POV-Ray, Blender is another amazing, extra-powerful 3D creation and editing software that can help geeky artists like myself realize their wild ideas into cool, impressive models. 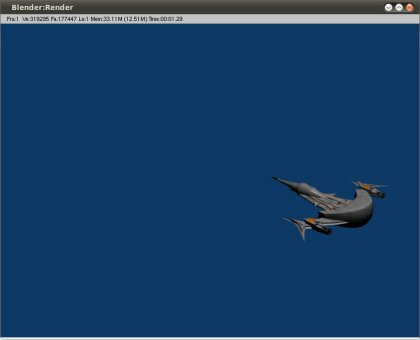 Not to be daunted by technology and GUI options, I set my sights on taming Blender. So far, things are looking good, so let's have a short, lovely tour. 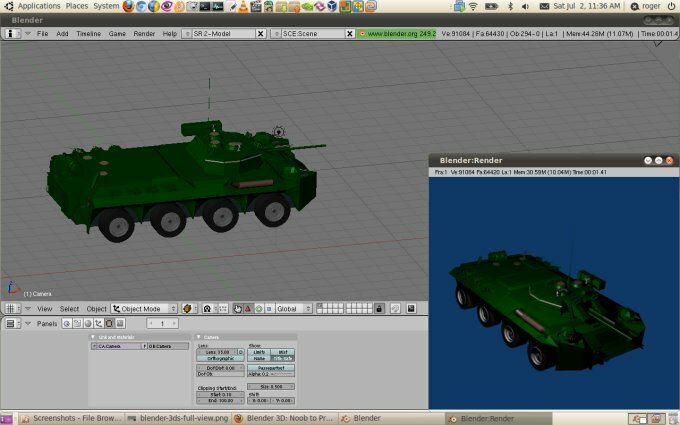 For me, Blender does not seem to be the ultimate creation platform, for now; I have Google SketchUp for that. But I am looking forward to making use of its tremendous editing capabilities to make my art even better. Rendering, perhaps even animation. 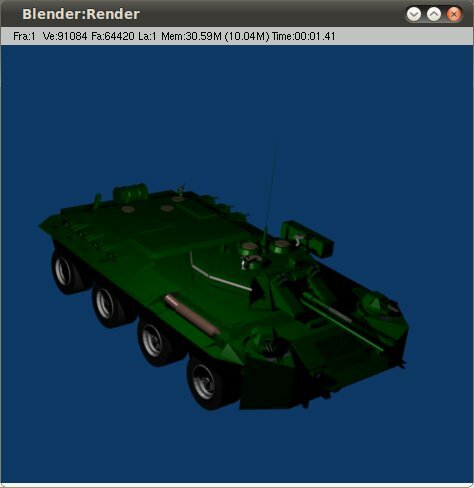 Indeed, Blender is a program designed for professional users, so if you're new to the world of digital art, you will struggle quite a bit. But after a day or two of mucking about with the settings, you will learn how to embrace its mystic powers and even begin using the handy shortcuts. Camera angle this, camera angle rotation that, select all, it starts to make sense. 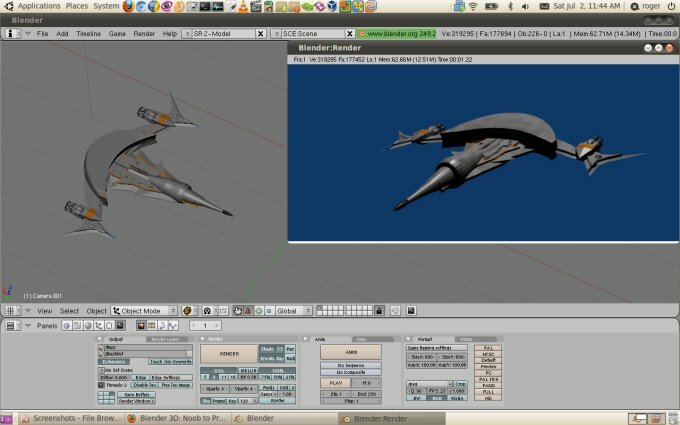 To see how well it copes, I imported my existing Kill Mobil and the new Starship models. Well, I must say I am thoroughly impressed. Even the small, default previews look rather fantastic. The play of color, light and shadow is just right. The models look real. And you can imagine that blue-screen background turning into a realistic setting. This camera angle struck me as lovely in particular. I'm really, really amazed by the rendering quality. Even without any special tweaks, the model is fleshy and real and with a wicked glint, just like you want it. There's a spaceship approaching a star dock or perhaps slowly orbiting a planet or something. Now that I know how to create realistic space background, this is going to be my next project. Like I said, this is just the tip of the iceberg. And with version 2.5, the interface has undergone a serious revamp, so I'm really looking forward to using this new edition. For now, a preview screenshot from a Windows installation, as the latest edition has not hit most Linux repositories yet. But you can still download the self-contained archive and run it from just about anywhere. All this great fun was done on Linux with a proper Nvidia card, so things run smoothly and fast, and I'm enjoying myself beyond measure. True, this is just a sampling, hardly even one percent of what the software can do, but we'll meet again in a few months and see what I managed to achieve in Blender. I am liking Blender more and more by the minute. I'm still a gigantic noob, but since I have the art part covered, now it's time to focus on the soft-ware [sic] skills, hihi. Surely, this is going to be another splendid journey. 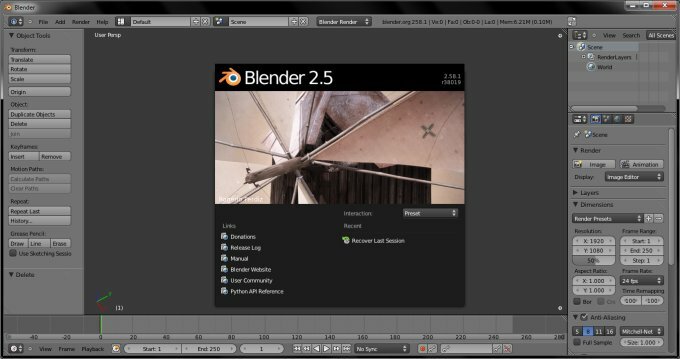 Blender gets 9/10, if only the menus were a little easier to read. See you around.